From our small mortuary to the great big graveyard, these are the skulls of Burlington. It’s been a terrifying few days in Burlington with cold wind and snow blanketing the beautiful red orange and gold leaves. The forecast is for it to get darker and darker until All Hallows Eve on Monday, then it will return to it’s usual lovely state. Our sponsor, Higher Ground, is likely going to send me to the gallows for not mentioning how great of a rock club they are but tonight I want to focus on the fusion of the physical world and the spirits that inhabit it. Our perception of life is merely the light dancing across shifting solid objects. Let’s explore this subject matter with a song called Shadow and Act by Invisible Homes on WBKM.ORG 107.1FM Burlington’s Kind Of Music, Plattsburgh’s kind of music and Danemora’s kind of music too. That was a song called Angels and Devils by Invisible Homes on WBKM.ORG 107.1FM Burlington, Plattsburgh, Danemora. Can you think of anything more terrifying than going back to your home after a long night at the clubs and finding it invisible? Once you find your way inside it must be hard to balance the angels and devils. For the tale before that I had to dig deep into one of our oldest graveyards to find the song Release the dead by Chin Ho. Did you enjoy Sarah Blacker’s tale of darkness and light in Oh My God? I hope Invisible Homes twin tales of Shadow and Act and Angels and Devils help you enjoy the thin thread between the worlds. Speaking of the devil. let’s take a journey to an ancient Vermont Farm for a song called Devil on WBKM.ORG 107.1FM Burlington’s Kind Of Music, Plattsburgh’s kind of music and Danemor’s kind of music too. Great Western must be terrified that the Devil Knows Their Name on WBKM.ORG 107.1FM Burlington, Plattsburgh, Danemora. Swillbillie told us a gruesome tale of a gun being used as The Devil’s Right Hand. Thompson Gunner told us a tale of he Devil’s Work, and Farm told us a story about freeing themselves from the hold of the Devil. Now, we shall let Hana Zara tell us about one of our most famous holiday’s. It’s called Day Of The Dead on WBKM.ORG 107.1FM Burlington’s Kind Of Music, Plattsburgh’s kind of music and Danemora’s kind of music too. Considering America’s imminent grand decision, perhaps it is just Two Weeks (’til the end of the world) as the band Grand so nicely stated on WBKM.ORG 107.1FM Burlington, Plattsburgh, Danemora. I hope you enjoyed Phil Yates’ tale of Ninjas Vs Zombies and the epic battle for life. If the zombies should win, at least they dance well, as Carraway explained in Raising The Dead. Hana Zara’s cheery tale of the Day Of The Dead should give you hope too, in the darkest of evenings. Are you afraid yet? I hope so because it’s time to be terrified. It’s time for Doom Service and a Welcome To The Hellmouth on WBKM.ORG 107.1FM Burlington’s Kind Of Music, Plattsburgh’s kind of music and Danemora’s kind of music too. That was a tale of the Vampyre by Dave Jarvis on WBKM.ORG 107.1FM Burlington, Plattsburgh, Danemora. Dave will resurrect his old body and band for a show tomorrow and I hear word that the Vampyre will appear. Were you more afraid of Crazyhearse’s story of the Demon Moon or Lake Superior’s Demon eyes? Both were pretty frightening. I hope you enjoyed your Welcome To The Hellmouth with Doom Service. They put on the darkest of shows last Tuesday at Nectar’s. This next singer plays all the time, but to find Alice Austin, you must go to a Graveyard Before Dark on WBKM.ORG 107.1FM Burlington, Plattsburgh, Danemora. Even ghouls like to surf so I hope you enjoyed the cover of Paranoid by Surf Sabbath on WBKM.ORG 107.1FM Burlington, Plattsburgh, Danemora. Since Vultures of Cult and SWALE are playing Black Sabbath cover shows on Saturday I had to subject us to Children Of The Grave by Jesus Christ and the Hallucinogenic All Stars. The Contrarian took us on a trip through One More Grave and we started in The Graveyard Before Dark with newly married Alice Austin. As all of the undead know, once you are in the grave, there is only one way to go, down. Fortunately, you will be guided by Our Lady Of The Underground as told by Anais Mitchell on WBKM.ORG 107.1FM Burlington’s Kind Of Music, Plattsburgh’s kind of music and Danemora’s kind of music too. Did you enjoy your journey on the Ghost Train with Jerichovox on WBKM.ORG 107.1FM Burlington, Plattsburgh, Danemora? I hope so, there will be more ghostly songs soon. The Grift thought You Will Make A Great Ghost and I agree. That was Marco Benevento and Kat Wright who admitted that I Put A Spell On You and Anais Mitchell was Our Lady Of The Underground. Some people are addicted to the supernatural but Aaron Flinn is forever Giving Up The Ghost on WBKM.ORG 107.1FM Burlington’s Kind Of Music, Plattsburgh’s kind of music and Danemors kind of music too. Better things are lovely kids to think that they can go around Killing Ghosts on WBKM.ORG 107.1FM Burlington, Plattsburgh’, Danemora. The Persian Claws left us Ghostified and Elephants of Scotland regaled us with a tale of Counting On A Ghost. Aaron Flinn is still Giving Up The Ghost and may do so for all eternity. This next group of individuals has demised as a band, but spend some time before they left Planning My Funeral. They were briefly known as Poxy on WBKM.ORG 107.1FM Burlington’s Kind Of Music, Plattsburgh’s kind of music and Danemora kind of music too. As we approach Halloween, we are all With The Dead as foretold by Vultures of Cult on WBKM.ORG 107.1FM Burlington, Plattsburgh, Danemora. I hope you were terrified to check out the music of our town. Let’s do it again next week, shall we? Goodbye. Farewell, See Ya, Sayonara. 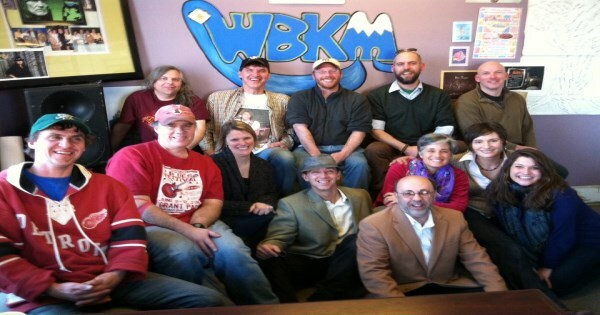 I just got back from my first live local music radio show since WBKM started transmitting on the web and 107.1FM. In the first break I remembered why I always did a break before the show started. From our small city to the great big world, these are the Sounds Of Burlington. Sorry for the mic not working at the beginning. I guess you really know that I’m live. It’s beautiful in Vermont right now but it’s really hot and time to head to the beach. I just love that song from the central Vermont band. I chatted with Winfield Holt from 1881 in the window of the show at Nectar’s last night and really want to catch his band soon. I remember seeing Blotto at Hunt’s a couple of times a long time ago. OK, here is the next song on Giant Places, the album I am playing through song by song, week after week, until the album is done. Kids played a great show at ArtsRiot last Saturday. Apartment 3 played the show and they were pretty awesome too. Villanelles are playing every Wednesday in July at Nectar’s. They played a great show last night with Invisible Homes. Next week Swale share the bill, so that will be great too. On July 28th the legendary Envy will reunite for a show at The Monkey House. It’s time to start getting excited. I still remember the first night I saw the Cush at Club Metronome several years ago. Jet played some great shows in the ’90’s and it was great to hear music diversify in so many ways. Now, you can hear almost any kind of music in Burlington. That was a nice mellow song from WW, another classic ’90’s band. OK, let’s keep rocking. This next band play tomorrow night at Manhattan Pizza and Pub. There’s always something on the radio when you listen to WBKM. You can hear great songs like Dead Summer. Real is another classic from the ’90’s when Zola played a ton of great shows. Death began in Detroit, then they moved to VT and became Lambsbread and now they are rocking as Death again. I loved the show they played at Flynn Center for the Performing Arts last year. Hmmm, Mountain. This next band played a great show last night at Nectar’s and this is one of my favorite songs. CC were another great band from the ’90’s. That’s a new song from Elephants who are putting out some tremendous music. Homes did a great version of Frequency last night. OK, let’s change things up a little bit. Cricket are playing at Main St Landing tomorrow and Radio Bean next Tuesday. Both Andriana and Binger played great sets at the Eat More Kale Festival a couple of weeks ago. Nice descriptions of VT by Portrait. This next singer is touring out west soon. Such a VT classic from Chin Ho. John Baumann used to play around as Satori but is now hanging out making music in OR. Great song from Francesca. I hope you enjoyed checking out the music of our town. Let’s do it again next week, shall we? I just got back from doing my local music radio show on internet only Wbkm Dot Org. I highlighted some of the music that happened this week and celebrated getting a copy of The Mountain Says No’s album JV. From our small city to the great big world, these are the Sounds Of Burlington. It’s 9pm and still twilight and the city is alive with music. Myra Flynn is playing in the ally at Red Square. There’s a band at the restaurant on the corner of Church and Main. Flowers are filling the air with staggering scents and filling our eyes with their beauty. I’m very excited that one of my favorite bands just got me a copy of their new album. I’ve loved this song for a while and am thrilled that I get to play it for you now. This is The Bomb by The Mountain Says No on WBKM, and this is Burlington’s Kind Of Music. Great song from when the great band resided in Vt. I just cannot stop playing that new Phil song. That one has been released, but the two before are so new, they are not out yet. OK, let’s play the last song, or is it, on Swale’s album The Next Instead. I’ll get to that question later. I had fun with the 37 second overmix between TFAY and Mary. Great songs from the current rockers and Plan B who played Nectar’s all the time in the late ’80’s or early ’90’s. I love that Swale song!! This is another great song from the ’90’s. Sometimes you feel like everything is going your way, and sometimes you feel dragged around the universe. That is dedicated to everyone who is going through a tough time right now. Things will get better. After listening to the Mountain song, I wanted to put it side by side with the Ninja and I think it really worked. Killer Peg song. This next band played almost every Friday in May at The Skinny Pancake. I caught the last one and was blown away! Sarah played a killer show on the Friday at the Pancake that Iris did not. I love the build in that song. Killer song from Maryse Smith I saw this next performer at Radio Bean on Tuesday playing with a killer bass player named Tom Carvey. It was fun to see Aaron rip it up on the electric guitar. The Bees have been around for a long time and they keep appearing now and then to rock us happily. Yet another killer Mountain song. I think the album is coming out June 27th at The Monkey House. Mark your calendar. This next artist will be never satisfied until all people have a great shot at making something in their lives. When they released The Next Instead they had Everyone Likes To as the lead off song, then put the alternate mix at the end. Since I’m finishing the album, I had to close with the remix. I like the circular idea of ending with the opening. I’ve loved that Mountain song for a while and that is a killer version of it that they assembled in the cave of legends. Many years ago Woody said this land is your land, and recently Binger said we all started from the same root and the tree keeps growing and growing. It’s nice to know we haven’t lost a thing. I hope you enjoyed checking out the music of our town. Let’s do it again next week, shall we?